Carrot cake for breakfast? 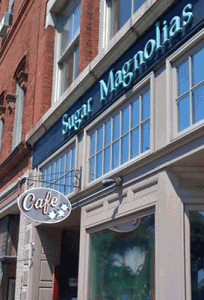 We came pretty close at Sugar Magnolia’s last weekend—and loved every bite. Along with several savory dishes, we ordered the full stack of carrot cake pancakes with maple cream cheese butter (3 for $6). The pancakes were huge and full of flavor, and the cream cheese was a delicious, frosting-like spread. It’s hard to beat that level of indulgence, but our other meals came close. We tried the Western Ave and the East Main omelettes. The former contained linguica, onion, pepper, and American cheese; the latter had spinach, tomatoes, bacon, and swiss cheese. Both were large, perfectly cooked, and accompanied by hash browns and toast for $7.50. The veggie scramble was an abundance of tender-but-not-mushy broccoli, spinach, tomatoes, and (our choice) goat cheese, a marvelous combination. 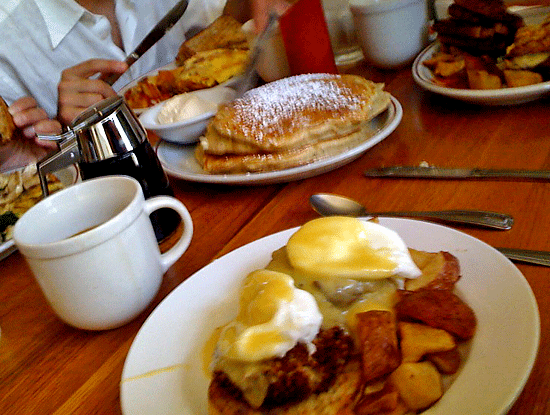 With toast and home fries, it was $8 and more food than one person could eat. The crab cake “bene” ($10) was superior to most we’ve had, with two very crisp yet light crab cakes, perfectly poached eggs, and a light, flavorful sauce. We also tried the pineapple fritters, which came with a delicious brown sugar dipping sauce. They were crisp outside but a bit soggy inside, due to the pineapple. Next time, we’ll go right for the carrot cake pancakes to satisfy our sweet tooth. The service was attentive, relaxed, and friendly, with as many refills as we desired on our bottomless cups of coffee ($1.50). Note that with food and service this good, there tends to be a wait on weekend mornings. Our wait was 15 minutes on Sunday just before noon—and well worth it.